I realise you were probably joking but I wouldn’t show some, possibly reluctant, linux learners a terminal that is green text on a black background. Confusion about where they are in the system – they don’ t have a clear picture of the architecture of the system. Things like Bash, X, and Gnome are all weird (because on the systems they come from these things are all mushed together in one, so you don’t have to think about them). To that end I use a (Ubuntu) live CD to start the course – this demos a safe, if slow, way to play with Linux without messing with your existing system. I leave the terminal with the default black text on white background – I noticed years ago people just seemed less fearful of it, perhaps unconciously fed by Hollywood (think Hackers, Matrix, etc), compared to the green on black / transparent that I used to use. I also start with non-admin type things like, browse the web, browse file system, create a document. This shows that on a simple usage level this isn’t some cryptic ‘only the wizards can use it’ system; for example I had one person on the course who thought that the only way to create a simple doc was to use LaTeX or Troff, because they last time he’d looked at Unix, 10 years ago that’s all there was. At the bottom is the hardware, drawn as spikey and irregular, since all hardware is different; different CPU, different GPU, different network cards, etc. The job of the kernel is to smooth out this irregularity and provide a unified interface to the rest of the system (as far as I think about it, that is the job of a kernel on any operating system). Above that is the command line or shell – now I’m slightly fudging things here but to help people understand I’d say that is what makes up a simple console based system. 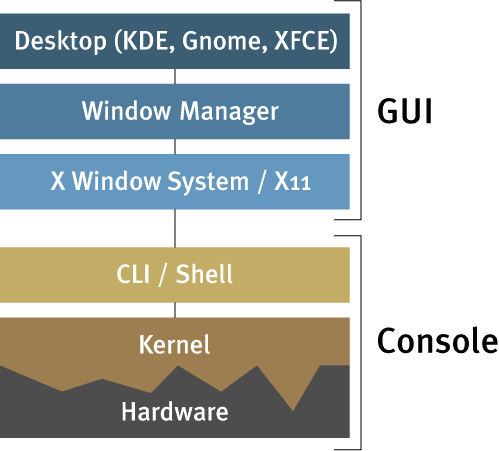 On top of that the layers of X, and a windows manager was all we had in Linux / Unix world until KDE and Gnome arrived. Of course these days the top layer (desktop) subsumes the window manager layer. The key thing to point out is that the architecture is such is that each layer has multiple implementations (a blessing and a curse) – the kernel could be Linux, FreeBSD, Solaris, etc, the shell could be Bash, Zsh, tcsh, etc, X Windows, could be Xorg, or one of the proprietary X servers, an the the final two layers have a huge diversity. Ctrl-Alt-F8 and now shows what a simple window manager does. You can then Ctrl-Alt-F2 again, and then Ctrl-C the window manager, and then either start another wm (e.g. windowmaker) to show how different it could be (i.e. how all policy is in the window manager not X) or start a desktop session, e.g. and then can see the full desktop (just don’t be logged in at VT7, as Gnome doesn’t like being logged in twice). People’s eyes really start to light up during this – either thinking of the possibilites, or just a whole new level of fear. Feel free to re-use any of this (it’s all Attribution-NonCommercial-ShareAlike) or push back if you think there’s a better way. However I’ve found that polypaudio has been brought back to life and from what I’ve read it looks like we should rip out esd and replace with polypaudio. Kudos to Cendio for funding some of the new developments which has seemed to kickstarted the project again. Now to see if I can get it working (or hope that someone builds a Dapper package). The motivator in all this, for me at least, is to be able to have my usb headset plugged in, allowing me to listen to tunes/podcasts in banshee and receive and make calls via ekiga / xten / gizmo / skype (for the time being I’m happy pausing the music myself until telepathy get’s sorted). Just in case anyone was unsure, my friend and colleague Elliot Smith is one of the world experts in Weetabix. He’s also seeking Google Juice. Absolutely agree on the loose flakes hatred. The thing I hate about Planet Advocacy is that my blog posts look considerably nicer than on my hastily (not)designed blog. Of course the nonsense I write reads just the same on both. Thinking this made me realise that I haven’t actually looked the design of most of the sites in my blogroll because I read them in an aggregator – I use planet (with it’s own lack of nice design). It’s kind of wierd to go back and look at how they have or haven’t changed. I wonder how this might change my perception of the content – I haven’t read Malcolm Gladwell’s Blink (yet – keen observers will notice him in my blogroll though) but I know one of the premises is that we all make our minds up about people, products, etc, in an instant, based on a number of factors including how we or the product look. So I wonder if and how people react differently to the same text or idea based on the design of the site delivering it. Software that rewards you for doing something one percent of the time will get used (email, word processing, SimCity) and software that punishes you for doing it only 99 percent of the time will not get used (calendars, PIMs, categorizing stuff, social bookmarks). This sums up the problems I’ve always had with any kind of calendering system, whether a paper diary or organiser or PDA or calendaring app.